For years, researchers have been looking for the right kind of material that makes the process more efficient and produces more electricity yet is not toxic. There are other materials that can generate power this way, such as cadmium-, telluride- or mercury-based materials, but those are toxic to humans. 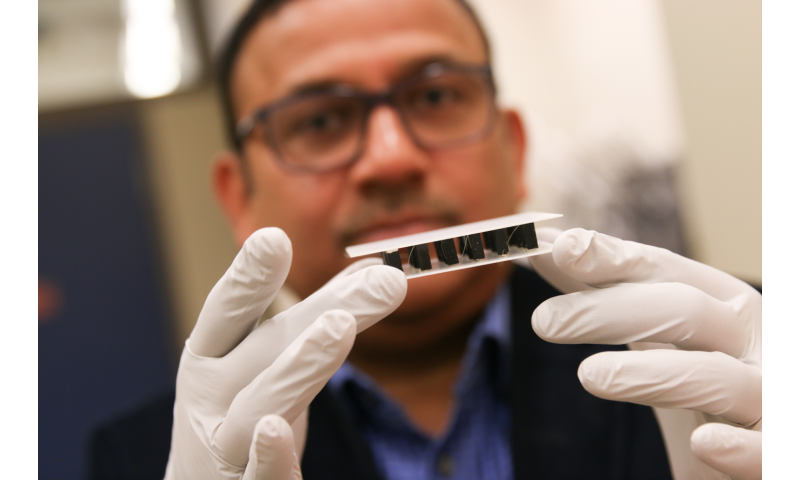 The unique advantage to this new material by Tiwari's team is that it is inexpensive to produce and, mostly importantly, bio-friendly and eco-friendly while still being efficient at generating electricity, Tiwari says. Therefore, it could be safe to use with humans. "There are no toxic chemicals involved," he says. "It's very efficient and can be used for a lot of day-to-day applications." "In power plants, about 60 percent of energy is wasted," postdoctoral researcher, Saini, says. "With this, you could reuse some of that 60 percent." "a combination of . . . calcium, cobalt and terbium can create an . . . inexpensive . . . material"
Maybe, but terbium itself is not inexpensive. Trivia: This was the metal they mined on Mars in the movie Total Recall. 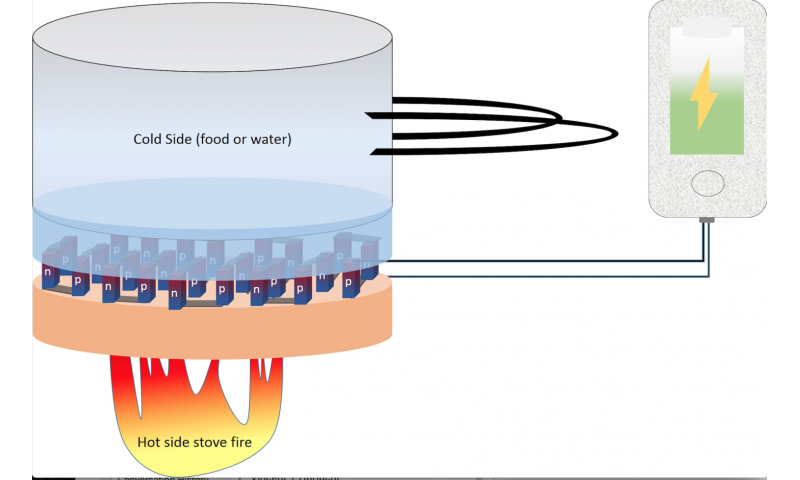 The effectiveness of thermoelectricity generation from waste heat is about 4%. So you can reuse some 2% of total energy with it. Internal combustion engine heat is waste, and is on the close order of 250°C. Anything we can get out of it is bonus. Global warming is one thing; 250°C is entirely another. Instead of using this device to convert heat from a cooking pan into electricity to charge a cell phone, why not just use the original fuel to generate electricity? Also, even though I cook most of my food, I rarely leave a pan on a hot stove for hours at a time. It's bonus only if the power can be obtained without additional expenditures, such as weight or materials or financial expenses. @TrollBane, you can do it with most metals. It's called the Seebeck Effect. Internal combustion engine heat is waste, and is on the close order of 250°C. The gasses may be 250 C on full load, but that's not all the time. And you have to transfer the heat to the device somehow which requires a heat exchanger - much like a CPU heatsink placed in the exhaust flow - which introduces pumping losses, which reduce the engine's efficiency for one point, and it also drops the temperature because the thermal reservoir that is the heat exchanger must be colder than the gas that heats it or the heat would simply not flow into it. Even in the simple case, where you're just blowing air onto a TEG plate, the plate is always colder than the gas you're heating it with, and so the actual temperature differential across the device is smaller than the gas temperature would lead you to believe. The usefulness of the device depends on whether the output is greater than the losses it would introduce in a particular application. Ideally, you'd want the gas to enter the device at 250 C and exit at ambient temperature, which means you've extracted all the potential heat you could, but if that is the case then the heat exchanger must be as cold as the environment (and infinitely large) - and if the heat exchanger is as cold as the environment then the temperature differential across the TEG is zero and no electricity can be extracted. So to maintain a temperature difference across the device, the heat exchanger actually has to let quite a bit of heat escape, so that the intake temperature is e.g. 250 C and the outlet temperature is 100 C and the heatsink temperature is in practice somewhat below that, let's say at 90 degrees, so the real dT between the heatsink and the cold reservoir, let's say it's ambient air, is just 70 C even though the incoming engine exhaust is 250 C.
This is a common issue for all heat engines extracting their energy out of a flow of hot fluid. The cold is taken form the ambient air. The point is to have a temperature *differential* - not an absolute cold air. It just needs to be coldER than the exhaust (which shouldn't be a problem). However the catalyser needs a certain temperature to operate, so you don't want to extract too much heat. Some externally combusting engines, like Stirling engines, go around the problem of lost heat by pre-heating the intake air with the leftover exhaust heat, and this is what dramatically increases their efficiency from the low 10% to 25% and above. The cold is taken form the ambient air. But how? Getting the device to reject heat into the ambient air requires a heat exchanger as well - you can't just expect it to vanish. If you put a radiator and a funnel/grille to draw air into the radiator on the front of your car, it's obviously going to increase drag. However the catalyser needs a certain temperature to operate, so you don't want to extract too much heat. You can extract heat after the catalytic converter. Put one end in the exhaus, put the other end outside the exhaust. You don't need to channel air to it because the environment does that for you. Air cools the side by radiation conduction and convection (just like the passive cooling fins on your CPU). There's no assisted flow required. You want to extract the heat from somewhere that is close to the place of combustion, because the output scales with the temperature differential. If you wait until after the converter then the temperature drops significantly. You can hold your hand in the exhaust of a car. Might not want to try this at a place where the exhaust has just left the combustion chamber. You'll find that not very effective in practice. You'd have to pipe the heat to the outer surface of the car somehow, because under the hood there's no radiation cooling, and assuming you have no intake vents there's no air movement. A heatsink inside a box doesn't do anything really. The amount of heat removed "passively" simply by hot air lifting off the surface is quite small. A typical computer heatsink with a fan removes about 5 Watts per 1 C difference. A typical car running along produces 20 kW mechanical power, and some 30-40 kW exhaust heat. If we allow 10 C difference you'd need on the order of 1000 heatsinks with fans to get rid of it. That's a lot of metal to carry. You can hold your hand in the exhaust of a car. When it's idling. You woudn't want to do that if the engine is brought to full throttle. That kind of heatsink gives off about 5-6 kW of heat with air being pushed through with a fan, when the water intake is ~90 C which is the point where the car's thermostat would open and turn the front radiator fan on. If you halve the water temp to ~45 C it would give off about 2-3 kW. You'd need ten of those to get rid of all the exhaust heat coming off the engine. True, you wouldn't need all that much because the TEG you'd design would not capture all the exhaust heat, but still - the scale of the problem isn't trivial. You can't just slap a bit of aluminium profile on the thermoelectric generator and call it done, because you're dealing with a massive heatflow. I studied this subject quite extensively when I was designing and building liquid cooling systems for computers, mostly for myself. Protip: almost all the kit systems you'll find in stores are no better than bog standard heatsinks and some are worse. They're just as powerful, or powerless, for the amount of fans and noise they need to get the heat out. An awful many of them are simply cargo cult engineering - or monkey see monkey do - with no real theory or critical thinking behind it; just whatever looks fancy, because these things started with nerds slapping random motorcycle oil coolers and aquarium pumps on their computers - and the commercial kit manufacturers simply copied them. People have surprising misconceptions about how heat and fluid flows work. A TEG stack is wrapped around the exhaust pipe after the catalytic converters, and coolant fluid is diverted off the outlet of the front main radiator into the stack, and returned through an extra radiator back to the front. The radiators get cooling air from the wind blast as the car is driving along. Look up Seebeck effect. The ends just need to be in contact with areas of different temperatures (and you will agree that your motor is hotter than e.g. the chassis of your car?). Depends on the area. Heat sinks do work quite well. (Note that the amount of power teh thing in the article generate is still very small. This is not an augmentation of powerplant output in the percentage range or anything like that. f we allow 10 C difference you'd need on the order of 1000 heatsinks with fans to get rid of it. And yet many motors don't spontaneusly melt. Weird, ain't it? It seems like a useful application of a TEG would be to replace the alternator. Even if it weighed and cost the same, the fuel cost savings would be on the close order of 20 cents an hour ( http://www.delcor...per.aspx - and presuming 400 watts average year round draw for a passenger vehicle ), and, as a solid state device, should be more reliable and longer lived. The needed peak output of around a kW is about 2 to 3% of the energy flowing out the exhaust while driving; at idle more like 10% of exhaust energy would need to be recovered. Congrats to prof. Tiwari and his team! Yes, but the whole device generates power from a heat -flow- and if there's no heat flow out of the colder object then it will very soon become hot. Also, a steel car chassis is bad at conducting heat. Where do you think the device is located and how? Because they're full of channels with water being pumped through - water which is then cooled down with the radiator at the front. And the amount of heat escaping through the cylinder walls is much smaller than the amount that escapes through the tailpipe as hot air, so you don't need such a massive radiator. It can also be hot, so a smaller surface area suffices to shed the heat. Here's the thing. Suppose you have a heatsink with some surface area A which is being cooled down with a constant flow or air F. It will reach a thermal equilibrium where the amount of cooling is dependent on how hot the heatsink gets. It can be characterized by a constant C/W or K/W or degrees per Watt. Every time you halve the temp difference to the ambient, the radiator size doubles: it takes twice the area and twice the airflow. Now here's the rub: an engine doesn't mind being hot, so it doesn't need much A or F to get rid of the heat. A TEG very much minds being hot. You want to make the cold side as cold as possible, because the hot side can't typically be more than 150 C before the semiconductors lose their properties. A regular car radiator is sized to keep at 90 C with the heat load from the engine coolant. That would make a narrow temperature differential. If you wanted to take it down to 40C when the air is 20 C, you'd need four such radiators. it takes twice the area and twice the airflow. Though that's not entirely accurate; it depends on the configuration. Eikka: "When it's idling. You woudn't want to do that if the engine is brought to full throttle." Nor would you want to do it in either case without holding your breath.